CarpalAID is a revolutionary invention developed for functional support of Carpal Tunnel Syndrome. It is a non-invasive medical device that is used externally in the palm of your hand. This incredibly effective patch is a single use disposable product that can be worn on either hand to alleviate symptoms of Carpal Tunnel Syndrome wherever and whenever needed-at work, on the go, or even overnight. Carpal Tunnel affects millions of people from excessive use of the hands from keyboard typing, driving, use of machinery, or sewing. But, worry no longer-you can now continue doing your job and the things you love with the use of a simple disposable strip. No expensive surgeries or drugs needed! Don't live constrained by the pain caused by carpal tunnel. Use Carpal AID and experience rapid pain relief and a new sense of mobility with your hands today. 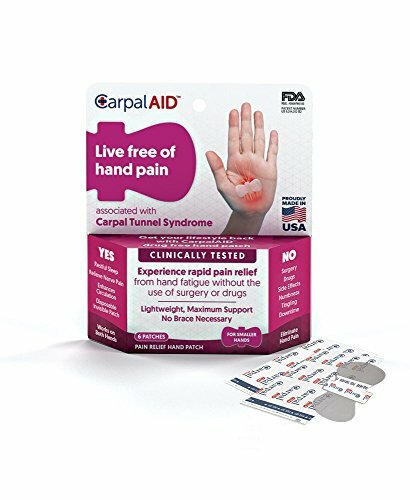 If you have any questions about this product by Carpal Aid, contact us by completing and submitting the form below. If you are looking for a specif part number, please include it with your message.